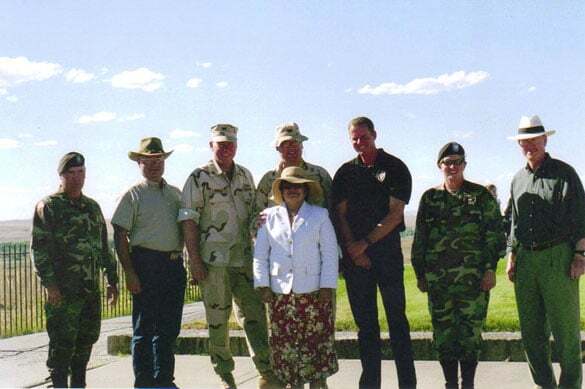 Rather than retire in Washington, Olga (center, front) organized a visit of “Last Stand Hill” at the Little Bighorn Battlefield. Joining us were (from left) Lou DiMarco, Marv Decker, Mike Mahon, French, Hank Adams, Joyce DiMarco and Jack Pattison. With the exception of Mike, all of us were Army officers. Hank’s father had been on “Heartbreak Ridge” in the Korean War; Mike was my National War College classmate and later made Rear Admiral! We also went on a four-hour horse ride of the battlefield in 100° heat – with a big Jacuzzi and cold beer afterward at the motel.